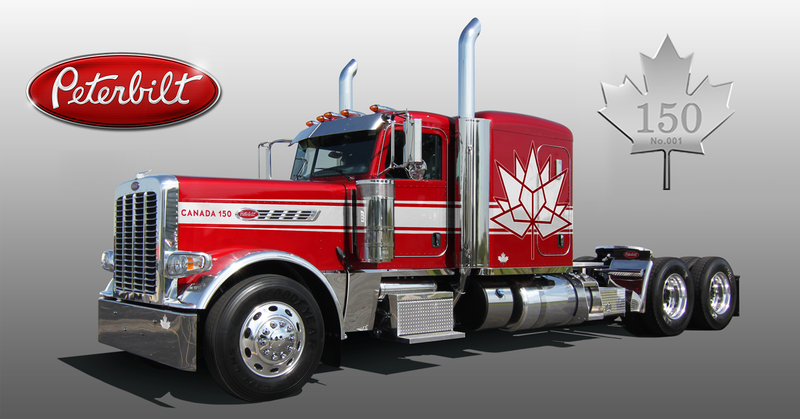 Not often I get to feature press releases from outside of Europa but I’m very pleased to say that my American favourites, Peterbilt, have gladly sent over a press release for a new speacial edition 389. I’ll hand you over to the people from Denton, Texas. – Special formulated Legendary Canadian red paint color.  Platinum-level Arctic Gray interior with a dark top dash with blackwood finish accents on the dash, doors, manual transmission shifter knob and sleeper cabinet trim; Peterbilt Premium Leather Seats Featuring a Maple Leaf on the Headrest; and Stylized steering wheel. This entry was posted in American, NEWS, Peterbilt by truckbloguk. Bookmark the permalink.